A question for all you aficionados of German renaissance-era knives- have you ever seen something as small as an eating knife with a nagel? Not necessarily an eating knife (could be an all-round utility piece), but something on that scale. I'm finding lots of bauernwehr and messers in the size of a typical modern Bowie or hunting knife (and much larger items as well of course) with them but nothing smaller. Period artwork, surviving artifacts, reasonably plausible recreations are all of interest, and anything downright dainty in scale would be great. Many thanks in advance! FWIW, I don't think I've seen a nagel on a smaller knife. Looking at the way they were often carried--as a set in the scabbard of a sword or Hauswehr/Bauernwehr, it doesn't seem like a nagel would work very well even if were useful. In fact, the nagel of the larger knife or kriegsmesser sometimes serves as a way to secure the smaller knives. As it happens, I'm not sure what use they'd be in these smaller items--not defensive, surely. So, a stop might be useful to prevent the hand from slipping onto the blade while using the knife. But think about modern food prep, which is the likely historical application for byknives--it is often very helpful to pinch the base of the blade between thumb and forefinger, and a nagel might interfere with that essential hold. Actually, I have seen them on very small knives that look like they would be for eating rather than as a weapon, but I'm afraid I don't recall what museums. I know I've seen this in more than one example. It certainly made me question the function of the nagel. On a larger weapon, the function is clearly defensive (even the period fighting treatises explain techniques that involve catching an oncoming weapon on the nagel), but on small utensils, I haven't the faintest clue why it is there. Thank you, Sean and Bill, for weighing in - I have mulled over the functional worth of a nagel on a smaller knife. Bill, if you think of where you've seen those, do let me know! I have never seen an eating knife with a nagle and I struggle to see what use one would be. 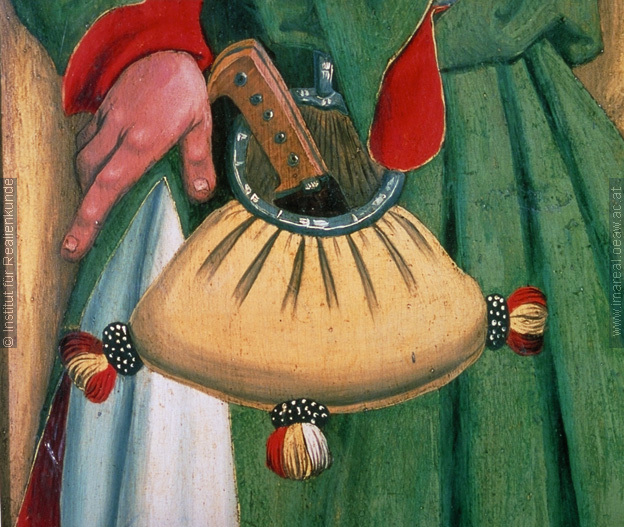 That of course has never deterred fashion, but in this case I think the very small nagle would be a positive nuisance to the functionality of the knife and I suspect it was very rarely, if ever done. Eating knife grips were on the whole to modern eyes, already pretty short and introducing a nagle would not help that situation. There, that should get some pictures of original eating knives with bagels posted! Seriously though, the closest I can think of is a732 at the Wallace; the very famous dagger and by knife set. The byknives have a small protruding stud near the pommel end of the pieces and this is to aid sliding them out of the scabbard, giving the owner something to grip onto. These studs are right in the grip area of the knife, and although they protrude they are rounded. Interestingly, the handle on the byknife is very slim and smooth and there is virtually no difference in width between the blade and the handle. One would assume that the hand could very easily slip onto the blade, but presumably they felt this was not important to them or they chose this route for other reasons. I have read several strong arguments for the nagle not bing a eating item at all. One of the manors books is clear not to use such items in place of a proper spoon or fork. My guess is that it would serve as a tool to run the edge of the blade on to deburr and work as a tool to get into small areas to remove dirt. While I can offer very little in terms of the historical plausibility of nagels on eating knives, I can, as someone who has been woodworking for too long and hobby-knifemaking for several years, speak for the practicality and need for finger protection on utility knives; namely, there is none or at least very little. Scandinavian knives (Puukkos, Tommis, as is my preference, for example) in particular tend to have the blade about the same width as the handle and nothing to prevent the hand from slipping; it simply isn't an issue. Very slight guards are found on some more modern example of these types of knives (and more pronounced guards are found sometimes on childrens' knives) but they are, as far as I have seen, almost nonexistent on traditional examples. The offset of a kitchen knife's cutting edge forward of the grip could, I suppose, be seen as a guard, but the actual purpose for that is to allow the full cutting edge to cut without bashing the knuckles. Any obstruction around the blade/handle transition of a knife, IMO, impedes its utility. I've accidentally cut myself in a lot of stupid ways over the last 17 years of knife use, but not once did my fingers slip from the grip to the blade, whether my hands be wet with water, sweat, blood or oil - I think that finger protection really comes into play (excluding defense from someone else, of course) when you're using the knife to stab things. That being said, I am well aware that form does not always follow function and I could see perhaps an eating knife that was specifically intended to match a sword or messer having a nagel - i could even see it being durable for eating with, but I think it would impede overall utility. Though of course, depending on the social status of the person with the knife, overall utility may be a moot point. I think you're thinking of the pricker, not the nagel. A nagel is a small protrusion on some messer and bauernwehr (?) hilts that seems to serve to protect the hand. Scandinavian knives (Puukkos, Tommis, as is my preference, for example) in particular tend to have the blade about the same width as the handle and nothing to prevent the hand from slipping; it simply isn't an issue. I can chime in, I am rather clumsy and have been using knives regularly for wood, leather, bone, horn, food and good knows what for 30 years, often in stupid ways with the "Mora"-kniv and its siblings: And while I also have cuts and nicks all over my hands, never ever have I had an accident with sliding up the blade..
To keep a little bit on topic, I have recently been researching german style knives for a messer-and-by-knife project, have not so far seen any by-knives with nagel, but if/when I do I will be sure to post here. I found this topic with a lot of pictures of bauernwehrs. Maybe some of the smaller ones there could fit the bill? Not all pictures show scale but it might be a start? Björn, I think you may be being hopeful there; they all look pretty standard size, except perhaps for this unusual beauty. See below, bottom right. That will be coming to a screen near you soon, because I am in love! This is clearly a very slender and elegant piece that appears to be cast brass/bronze and looks like it has a nagle, though hard to see for sure. It could be the handle of an eating knife, but it would be unusually long if it were so. The blade is very degraded and so maybe it was once wider and it was perhaps exactly what it is most likely to be and that is a very tasty 'normal' bauernwehr. However, on reflection of the OP, I stand by 'not that I have seen' and 'for what purpose?' But we all buy many things for no good purpose (electric fly swats for instance), but maybe Hans wanted to buy a present for Otto, the head of his guild. Otto being wealthy has pretty much everything he wants, but he does not have an eating sized version of his favourite hunting knife; what better present to give at the next cloth makers guild annual hunt and disco? Times change, but people stay the same. It could have happened, so why not go for it. As as a slight digression; as a maker you sometimes see things and know that your particular set of skills will work well for it and this piece calls out to me. I love the sheer elegance of it. Anyway enough of that. The size of the piece at 14 cm, means it has a grip of maybe 9cm so is definitely an eating knife. At first I thought it had a nagle cast in place, but I now think the shadow I see is a dip at the start of the handle. So no nagle I am afraid. Ahhhh, I knew somebody would bring that up... Anybody remember that movie from the eighties where the police stop a guy carrying nunchaku in his back pocket, and his defense is that no, they aren't chucks, they are chopsticks: "I'm a big eater!" Seriously though, Bjorn, thanks for linking that thread. It is one of my favorite idea hoards, and anybody who likes this family of knives needs to absorb those images! While the piece I'm working on is much smaller than anything nagel-bearing in that thread, I have found something there that, combined with the studs on the byknives in the Wallace A732 (Tod's first post above), will serve as inspiration for a plausible, if not pedigree-able, design. As Tod has encouraged, I'm going to the Hunt and Disco... I like the idea of a small nagel/extraction stud and I think I can answer the "purpose" qualification well enough to not feel like I'm too far out in fantasy land! Thanks all for weighing in! There are hundreds of common knives depicted among IMAREAL's riches. I don't see any projections on eating-size knives. There are some very interesting artifacts and paintings, though. Nearly forgot to add - this thread inspired my today to make an eating knife and pricker set - no nagel on it, but some long-overdue forge time! Hmm... looking through my books, perhaps I was mistaken about the nagel on small knives, though there are a number of them on knives the size of kitchen knives. I've often wondered if the original purpose of the nagel was simply to prevent the knife from slipping through the belt/pouch, since so many of them were just tucked in and not specifically attached. ... I've often wondered if the original purpose of the nagel was simply to prevent the knife from slipping through the belt/pouch, since so many of them were just tucked in and not specifically attached. Lukas MG & Tod made & posted 3 very nice big ruggers in 2016, causing me to search & see what has been said about the odd nagels. Bill's thought is interesting. Fwiw vs. a few other threads that (in passing) mention nagels, I'd think if the primary purpose was hand protection during fights the nagels would have been larger. Are there fair number of images of ruggers simply tucked into belts? Perhaps nagels are so could go without a sheath plus adds a minor fighting feature? vs. the OP here is a 10" blade with a nagel - would make an excellent steak knife! This is good timing for this thread to resurface to the top of the pile. While I've been doing research on single-edged arms in general for more than a little time, for the last few months that's specifically been looking at the groupings of bauernwehr, hauswehr, rugger, tasack and parasztkés, carefully going through a few hundred of the things from national museums in Germany, Switzerland, the Czech republic and Hungary, assembling a hit-list of ones to catalogue in detail. (And yes, Austria's on the list too, just not even started there yet!). Alongside that, the last few years I've been looking more in detail at the development of the cutlers' trade, particularly in western europe, and identifying those contemporary civilian knives for eating etc. So I think I might be able to contribute a few thoughts here. However, in contrast to the contemporary eating knives, with blades of just 100- 120mm length, and only 15mm wide, its rapidly apparent on study that these are as distinct as the butterknife in your kitchen, and a survival knife in your camping kit today. I am extremely cautious in attributing those knives with nagels to anything close to the same group as eating knives, in that I've done a couple of studies of the bauernwehr and tasak, and the smallest ones tend to almost all fall into a blade length of between 220 and 250mm, with just one or two outliers either side of that length. There are plenty of tasak, too - and particularly thanks to Petr Žákovský's superb work in the Czech republic, we have a solid record of a range of several dozen of those, so those figures arent simply averages of two or three. Of those, there is one small tasak with nagel, paired with a pricker and most importantly, a fork, that has remained unpublished in any Czech, yet alone English-language publication. (I'll attach a picture at the end.) That item is a singular example in excellent preservation, which is all the more remarkable for the associated items. I have yet to handle them in person myself, but I have no reason to doubt Petr's frankly excellent research work, so I would assume they are original until such time as we see evidence otherwise. As such, its dimensions are absolutely typical of the small tasak, yet is still a relatively large blade - 218mm, (8.5 inches) long, 321mm overall (13 inches), with an extremely stout spine - 7mm thick at the nagel. And its notable that the pricker and fork are much more gracile in form, so much so that they have a distinct difference in heft just looking at them. The other detail to emphasise is that as a set they are absolutely unique to the best of my knowledge - no other associated sets have been found that I've seen, out of dozens of archaeological examples, I've not seen any finds of multiple groups of objects which could be identified even as the heavily decayed remains of prickers, forks or small by-knives, so I am very reticent to describe them as anything but an atypical example. The presence of a fork also indicates that it is perhaps of a mid 16th century date, compared to many of the simpler examples which may well be up to a century older. At this point we simply do not have sufficient evidence to establish any sort of speculation on the prevalence of such cutlery with the larger knives - we can only conclude that it is possible, but not common. 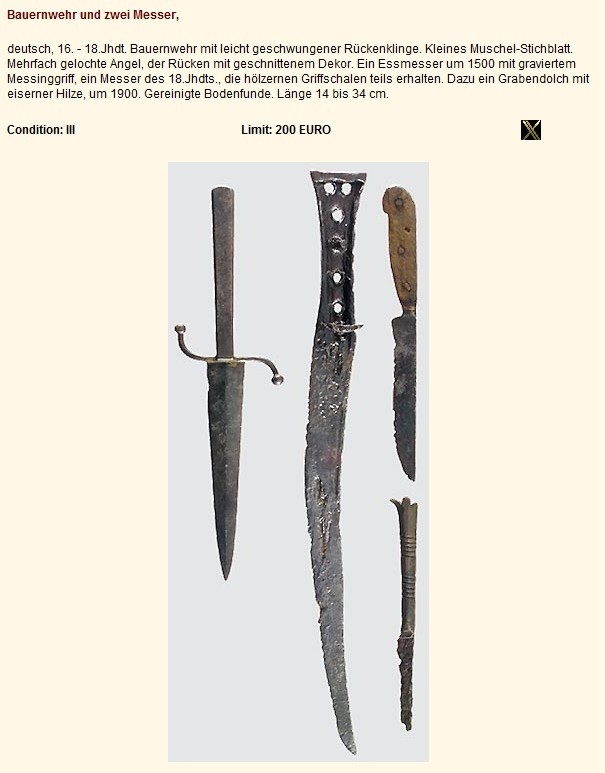 now, looking to contemporary eating knives, there's an entirely different possibility which raises its head when you research this, which I dont think anyone has previously spoken about in any of the discussions on the subject of nagels etc: The geography and economic trade routes. If we take the the heyday of the bauernwehr style knives as around the start of the 16th century, +/- 50 years either side, we're left with a rather important disparity. These blades with nagels are not really exclusively "German" as people have so often described them - that's something of a Cold War hangover which divided europe for the 2nd half of the 20th century, and left half the sources behind the Iron curtain. The reality is they are a central European fashion; they are found commonly in southern Germany, in Switzerland and austria, but they are also found in far greater numbers in the Czech Republic, and Hungary - small numbers of them are found in the netherlands, fewer still in France, and almost nothing in England, and likewise, small numbers are found in Croatia, and Romania. A map of the distribution of the knives indicates a cultural origin in Central Europe. In contrast, the primary scale-hilted eating knives, are particularly convenient through the growing use of copper-alloy "knop" fittings or pommel-caps, or slab-sided engraved scale decorations, these knives have distinctive design details which as copper-alloy items allow us to far better trace their spread. 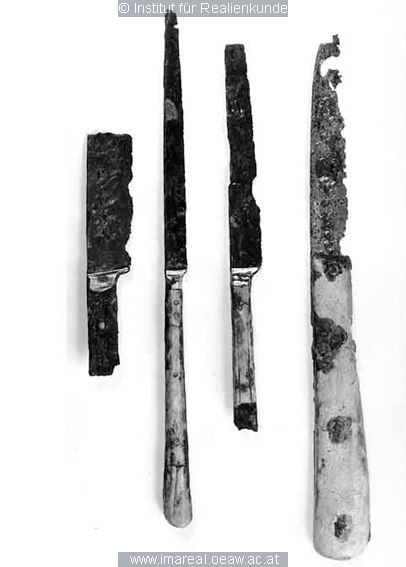 And what a spread it is; Identical knives can be found pulled from the Thames, from museums in Stockholm, Paris, Solingen. I've even seen examples found in modern-day Turkey. 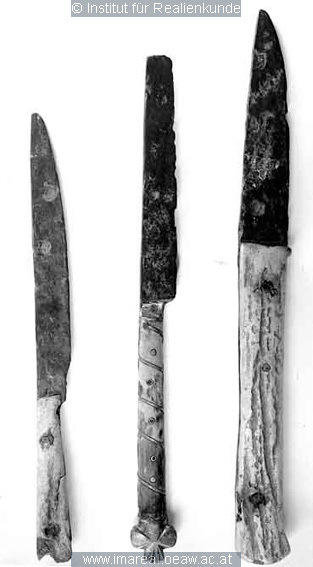 As such combined with the few studies on finds (Mills, N. 1999) and the artistic style of those preserved engraved panels, it appears that the primary site of manufacture for eating knives was not distributed through the whole of europe, but clustered in Flemish Netherlands, or Burgundy, and were being exported in vast numbers. There's certainly evidence of imports from there to England in the 3rd quarter of the 15th Century, through the fact that they were briefly outlawed by Edward IV - presumably as they were a competitor to the London cutlers' guilds who wielded so much power and influence. 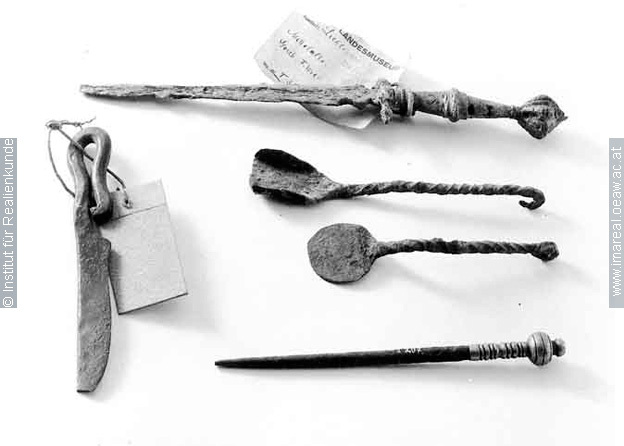 And there's no doubt there were local copies, but there is a consistency in the castings of these items - huge numbers of the knops for instance are recorded in the UK's Portable Antiquities Scheme database, matching in details. (One of these days, when I have the cash spare, I'd like to buy one or three, they crop up on ebay regularly, and given they are common, put it through neutron diffraction and XRF analysis, and see if it can be cross-referenced by the isotope rates, to identify the source regions the metal came from. We know from well-preserved examples that rather than a reddish bronze, it appears to be a golden-yellow latten brass - further indication of the flemish origin by the data would be an icing on the cake). I cannot, as a craftsman, see that these were being duplicated in significant volumes; rather, they were originating from the same sources. so what does that tell us? well. 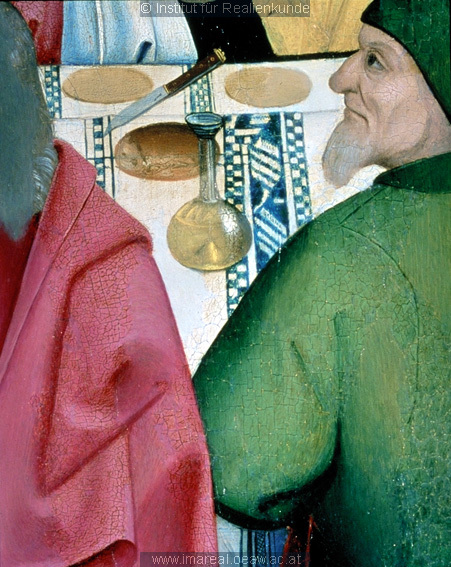 to my mind, it suggests the following: that a principal reason for the lack of eating knives with nagels, is simply that the places where most eating knives were being made were not places where nagels were used. And while the eating knives have a vast geographical spread, particularly through maritime trade, the knives with nagels have a more regional distribution. In other words, they may both be knives, but they're from different parts of europe. And if they were driving the fashion and controlling the market that rather explains the fact that they were not being influenced by those knives from central europe which were on the periphery of their area of influence. Of course, I could be totally wrong here. Wouldnt be the first time. But its something to think about.